Dotterrer said if he had to return to the Marine Corps today, his sidearm of choice would be easy. “The M1911 is the greatest pistol ever invented.” The M1911 is the second-longest-serving weapon in the U.S. inventory, adopted as the standard sidearm for all four branches of service from 1911 to 1985. However, even after it was “retired,” it never truly went away because of the trusty reputation it gained during use in every conceivable theater, terrain and environment. The history of the M1911 began in the Philippines during the Spanish-American War when U.S. soldiers and Marines found themselves locked in fierce combat with the Moro, a knife-wielding native insurgency that combined religious zeal and potent drug use. Much of the fighting was close-quarters battle and the hopped-up Moros took round after round from the .38-caliber pistols carried by U.S. forces while they continued to hack away at Americans. If anything positive came from the bloody 15-year guerrilla war, it was the realization that the U.S. Military needed a better pistol to deal with these adversaries. Looking back to an older weapon pointed the way to a solution. In desperation, the Army had issued Colt Model 1873 .45-caliber revolvers, dating back to the Plains Indian Wars, to soldiers fighting the Moros. The heavier round began to turn the tide and often only one well-placed shot from the .45-caliber revolvers killed the Moro adversaries. In 1906, General William Crozier of the U.S. Army Ordnance Department began evaluating several pistol designs, along with the suitability of a new cartridge, designated the .45-caliber Automatic Colt Pistol or .45 ACP. The weapons examined were a new semi-automatic self-loading design so commonly used in hundreds of pistols today. 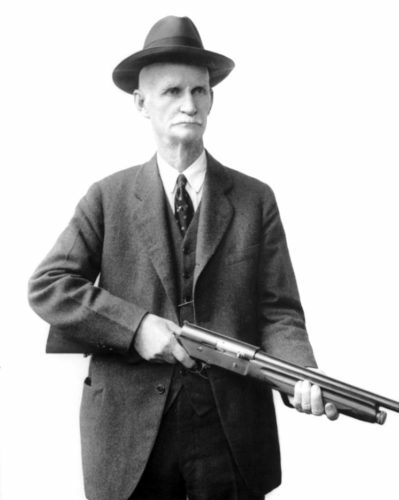 One man who would eventually offer a pistol for consideration was John Moses Browning, the most innovative and successful weapons designer in American history. 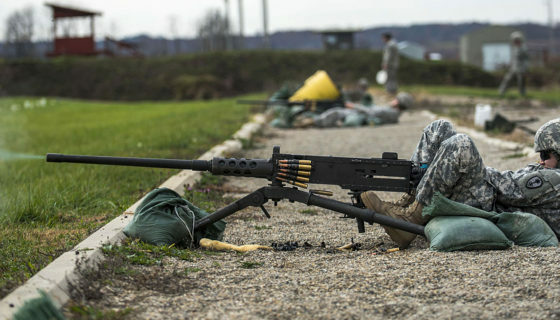 Browning created the M1918 Browning Automatic Rifle (BAR), the M1917 and M1919 .30-caliber machine guns, the M2 .50-caliber Browning machine gun and the Browning Hi-Power 9mm pistol. In fact, the Hi-Power was the first successful high-capacity semi-automatic pistol and became the most widely used military sidearm in the world. Based on the short recoil principle of operation, the Browning-designed Colt used for the Army pistol trials was a magazine fed, single-action semi-automatic pistol with both manual and grip safeties. The pistol was rugged, simple to field strip and claimed to possess utter dependability. Those claims were put to a torture test in 1910 when a prototype Colt M1911 fired 6,000 rounds over the course of two days. Browning’s sample pistol became so hot during the trial that he dunked it in a pail of water to cool it for further firing. Despite this, it passed the test with no malfunctions, while its closest competition suffered 37 malfunctions. 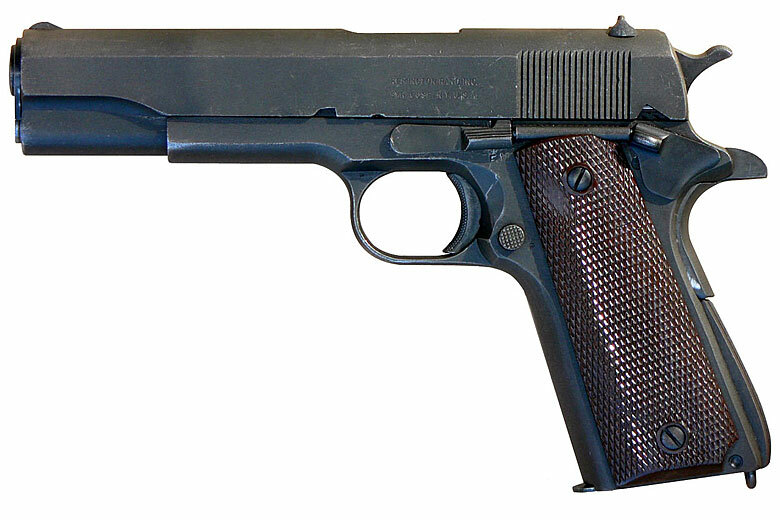 Once adopted, the M1911 saw service in the U.S. Military during both World Wars, the Korean War and the Vietnam War. Despite the fact that Congress pressured the Department of Defense to adopt the M9 Beretta that used the standard NATO 9mm round, select units in the U.S. Military continue to use the M1911 to this day. 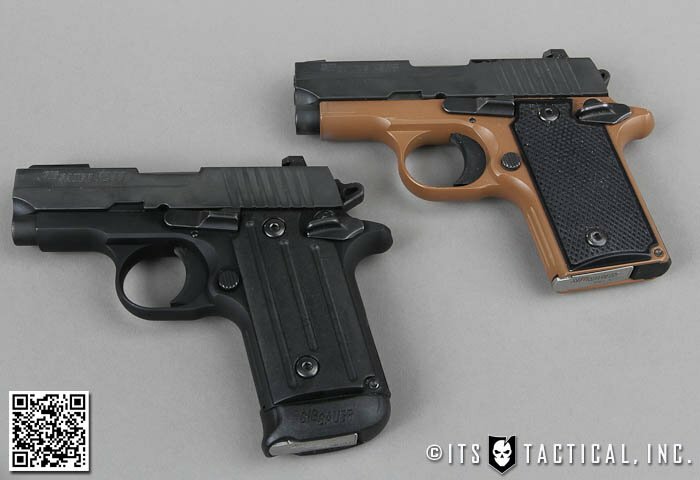 Last year, the Department of Defense decided to phase out the M9 in favor of the Sig P320, the result of a nearly 10-year search for a replacement to a gun that had more than its share of critics. 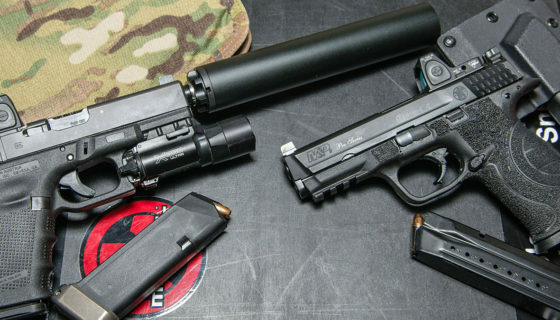 The Army announced they had awarded a $580 million contract to Sig Sauer for what’s called the Modular Handgun System. This contract includes handguns, accessories and ammunition. The M9 will remain in use and if nothing else, National Guard units will probably continue to field the weapon. It will take awhile for the P320 to make in-roads throughout all branches of service. Despite these continued changes, the M1911 is still out there in the hands of troops. U.S. Army Special Operations units particularly favor the pistol. In the civilian world, Law Enforcement Officers, whether patrol officers or SWAT team members often carry the M1911. In addition, it’s a very popular concealed-carry weapon for ordinary citizens. As for the Marines, they never really gave up the M1911. 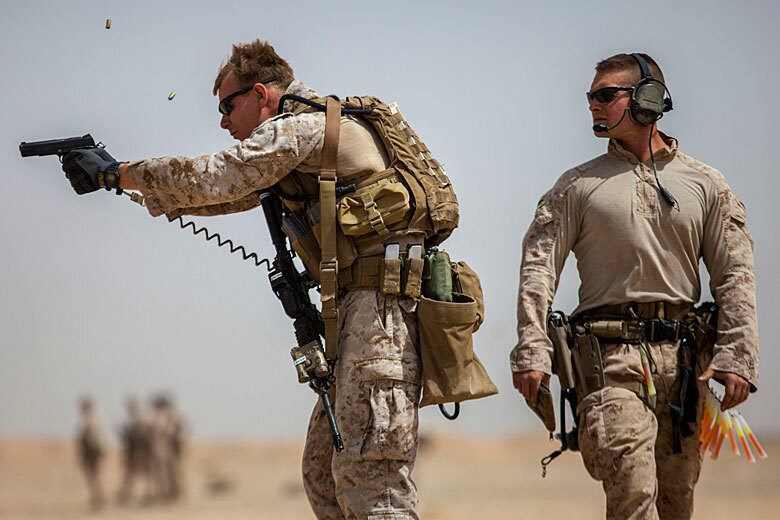 The Corps just refined the weapon and gave it another name, the MEU (SOC) pistol. 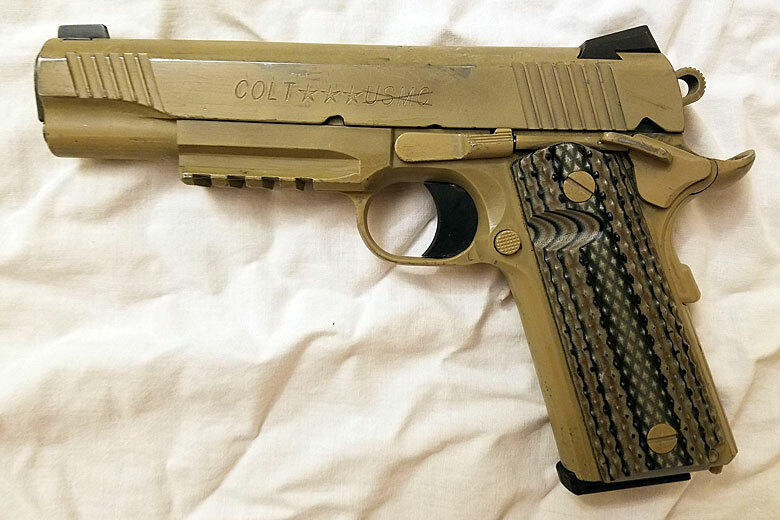 Additionally, in 2016 Colt delivered a variant of the M1911 called the M45A1 Close Quarter Battle Pistol (CQPB) and the $22.5 million contract provided 12,000 new weapons to the USMC. The CQPB is definitely an M1911 for the 21st century. It has a flat, desert-tan-colored Cerakote coating, an under-barrel Picatinny rail, fixed Novak three-dot night sights, an enhanced hammer to prevent “hammer bite” and an ambidextrous safety. Even with these upgrades, the pistol stays true to its roots and fires the .45 ACP round, still shooting like a dream. Although multiples pistols have attempted to replace it, the M1911 still holds an active role in the Military, Law Enforcement and civilian world. In addition, it enjoys a storied history as one of the most popular and effective handguns in the world.